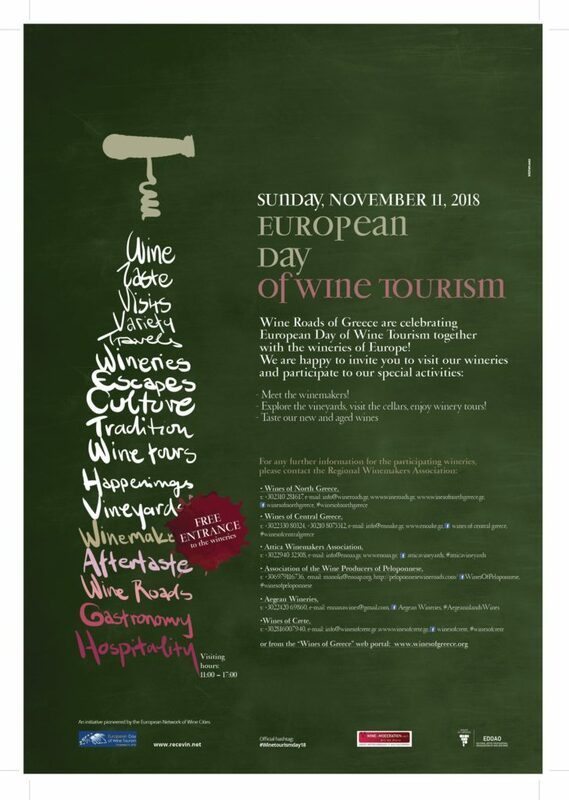 On Sunday, November 11, wineries of the Wine Routes of Greece participate in the European Day of Wine Tourism with hundreds of other European wineries and invite everybody to celebrate with them. Winery visitors will have the opportunity to walk around wine regions, get to know Greek winemakers, enjoy the scenery in beautiful vineyards, tour around wine production, maturation and aging facilities, try new and vintage wines and get an update on the fresh wines of this year’s harvest, which has just finished. The European Day of Wine Tourism was established in 2009 and is celebrated annually on the second Sunday of November with the participation of wineries – members of the European Network of Wine Cities (RECEVIN) or Wine Tourism Networks. The European Day of Wine Tourism is a great opportunity to be initiated into the enchanting world of wine, get to know the wine-making process and taste exceptional Branded Greek Wines. – Santo Wines will be offering wine tasting throughout the day in the wine bar, free winery tours at 10:00, 12:00 and 15:00, as well as free of charge documentary projection about the winemaking history of Santorini at 10:00, 11:00, 12:00, 13:00, 14:00, 15:00. – Sigalas Winery will have its tasting room open from 11:00-17:00 hours and will be offering 10% discount on wines and spirits. – A. Karamolegos Winery will be open from 11:00 -18:00 hours and will be offering a glass of Santorini wine to its guests. – Roussos Canava will be open from 11:00 -15:00 hours for free wine tasting and will be offering 15% discount on wines. – Estate Argyros will be open from 10:00 -18:00 hours.